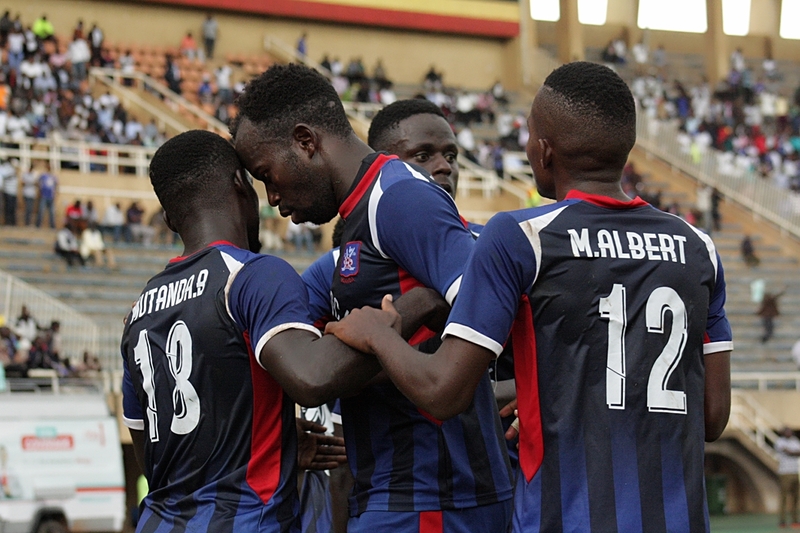 NAMBOOLE – Pius Wangi struck a brace as SC Villa defeated Paidha Black Angels 2-1 in the StarTimes Uganda Premier League. In one of the six games played on Tuesday, the former Vipers winger scored two first half goals and despite Paidha pulling one back in the second half, the jogoos held on to win back to back games for the first time this season. Paidha seemed to be up to the task at the start, throwing numbers into the Villa half but they were made to pay at the other end as Pius Wangi lashed onto a through ball, found himself one on one with John Kalumba and slotted into the net for 1-0. Moments later Bashir Mutanda thought he had scored his 12 goal of the season when he turned the ball in off Douglas Owori’s through ball but he was judged to have been in an offside position. At the other end, Paidha had their first real opportunity but Dickens Okwir headed straight at the woodwork with Saidi Keni in the Villa goal beaten for dead. On 9 minutes, Kalumba tried to dribble past Charles Lwanga who robbed him of the ball but the custodian was relived to see the ball go out for a goal-kick. With just 17 minutes of the game played, Villa made it 2-0. Wangi who scored the first goal was at it again, turning in Lwanga’s low cross from the right with Kalumba beaten. Villa could have added another instantly after the restart but this time Kalumba foiled Owori from close range after he was played in by a delicious through ball off Mutanda’s deadly right foot. The wave after wave of Villa attacks looked to have been halted as the Jogoos decided to control the game. In response, Paidha started manufacturing several half chances and Keni had to be called in action on several occasions. With 6 minutes to half time, Lwanga wasted a glorious opportunity to put day light between his side and the visitors when he failed to convert one on one with Kalumba after he was played in expertly by Emma Kalyowa. By sound of the first half whistle, Villa was in charge of proceedings, holding a healthy 2-0 lead. Just like it was the case in the win over Vipers last Saturday, Joseph Ssemuju replaced Pius Wangi at the start of the second half. Paidah made their first substitution on 52 minutes with Pate Wanox replaces Hassan Patib. Moments later, Okwir pulled a goal bavk for the visitors, pouncing onto a Derrick Ndahiro poor clearance and striking past Keni from a tight angle. Replays shown the ball deflected off Asuman Alishe’s foot and wrong footed Keni. Villa looked to have woken up and Bashir Mutanda again found the back of the net off Kalyoowa’s through ball but was once again judged to have been offside. At the hour mark, Villa made their second substitution with Habib Kavuma replacing the booked Adriko at Center-half. Kasirye Muhammad become the second player to be booked on 62 minutes for a foul on Lwanga. 35′ Okwir pounces onto poor clearance by Derrick Ndahiro and shoots at goal. Four minutes later James Wambade missed a good chance to pull the visitors level, blasting over Okwir’s well cautioned header inside the Villa area. Paidha pressed for an equalizer but were always suspect on the counter and on 72 minutes, they were only saved bu Kalumba who raced off the line to foil Mutanda who was through on goal. In the process, the custodian hurt himself and did seek for medical attention. With Kalumba getting medical attention, Villa made their final substitution, sending on Lincoln Mukisa in place of Lwanga. Moments later, Kalumba signaled that he desired to be taken off and was replaced by Pius Dibala. With the game approaching its climax, Kavuma whipped in a cross from the left which was controlled by Mutanda who in turn teed up Owori but the midfielder blasted over from just outside the box. Dickson Galabuzi was booked with 4 minutes to play for tagging back Mutanda. On 87 minutes, Paidha sent on Andrew Kidega to replace Wambade in an effort to find a second goal. With just a minute to normal time, Kidega squandered a glorious opportunity to score a second for the visitors, striking first time a cross from the right but his weak effort was comfortably dealt with by Keni. Villa who defeated Vipers 3-1 on Saturday now move onto 21 points and into 10th position on the standings. For Paidha, they remain rooted at the bottom of the log having gathered only 9 points so far.